High maintainability and quality by communicating through virtual switch, a common communication engine. High portability to various OS, by separating user interface that heavily depends on the types of model. Enables designing a network taking the quality of telecommunication link into consideration. Easy to use from other applications, since control of communication engine is done by common APIs. 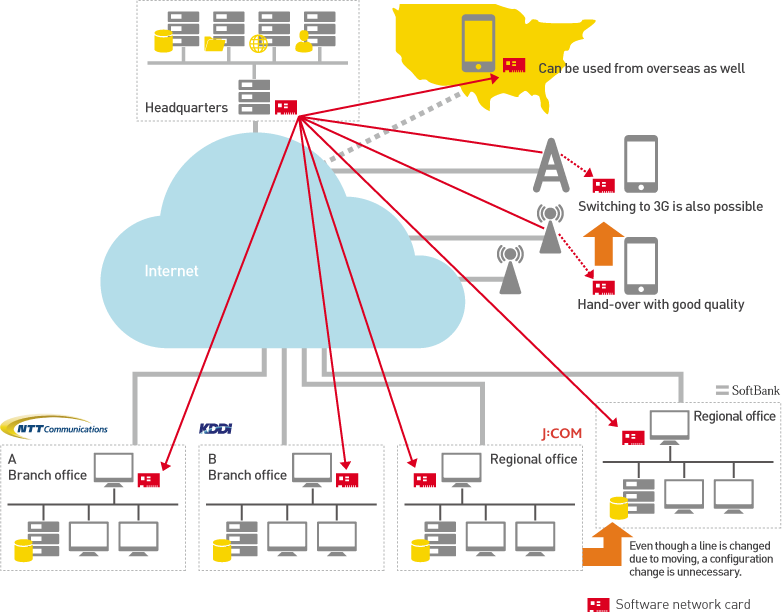 Communication utilizing MAC addresses, which does not depend on protocols. Available where IP communication exists and provides high compatibility with the Internet. Supports various communication system such as wired LAN, wireless LAN, dial-up connection, packet communication, power-line communication, and leaky coaxial cable. Excellent compatibility with NAT, Proxy Server, and Firewall. Virtual switch can be installed on various devices. Virtual network, that is independent of physical devices, allows usage regardless of any circuit, telecom operator, and communication technology. Network can be changed by solely software configurations. Existing network devices can be used without change. In many cases, change of configurations of network devices is unnecessary as well. Provides high scalability; you can purchase and use what needed, when needed, in the amount only needed.